Home » News » Local Company Helps Our Local Hero! 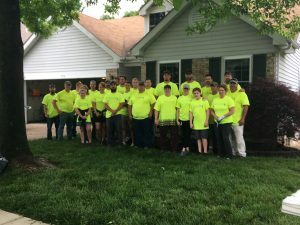 A local St. Louis company, Patriot Sunrooms, stepped up in a big way to support a JCS Hero. On Saturday, employees of Patriot Sunrooms volunteered to install all new windows, storm doors, and gutter guards in Josh Eckhoffs house. They also power washed the home and planted flowers. The materials and labor were generously donated. Josh was taken out to lunch by the owners, and returned to find the work done. Thank you Patriot for supporting our Heroes! !